I have always been a fan of Calafuria, which is a company without me knowing at the time in the eighties introduced me to the Italian traditional Gozzo fishing boat. How is it, that canoe cabin fish boat can plane and go fast? A lot of reasons, but mostly is because Mr.Catarsi was among the first to experiment with hulls before the world hybrid even existed in this element of semi displacement nature, having planning characteristics. Calafuria's new model, is the 30 Fly presented in project on PowerYacht on October 2010. The new 30 Fly as all Calafuria is a traditional looking from a certain view point motor cruiser, with versatility being key to many elements. 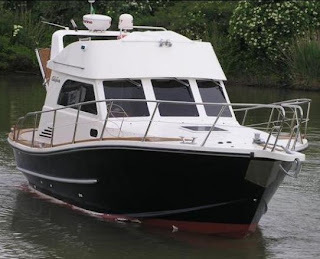 We can start from the fact that as any Calafuria it will have fishing boat features, but this does not disclose it from a comfortable interior which is also available in three different choices. From an open single master cabin with huge spaces, to a Vee shade double, and two guest bunk berths to port or starboard side as you may prefer. The galley on the 30 Fly is located on the main deck to port or starboard side, also as one desires, and same goes for the L-shaped settee. Power is form twin 270 or optional 320hp diesel engines which give max speeds up to 26 knots.